Sittin' In with the Big Band, Volume 2 (B-Flat Trumpet). For B-Flat Trumpet. Instrumental Series; Play-Along. Sittin' In with the Big Band. Jazz. Grade 3. Book & CD. 32 pages. Published by Alfred Music (AP.30670).ISBN 0739057014. Jazz.Sittin' In with the Big Band, Vol. II is more than just a fun play-along kit. 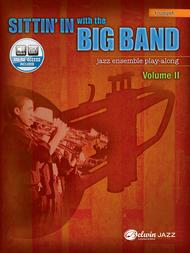 This book and CD set features 10 big band charts written at the intermediate level. It provides an opportunity to play along with a professional jazz ensemble and improve performance skills. As students play with and listen to the outstanding players in the band, they will learn about blend, style, phrasing, tone, dynamics, technique, articulation, time, and playing in tune. Performance tips and suggestions are included in each book. Books are available for alto saxophone, tenor saxophone, trumpet, trombone, piano, bass, guitar, and drums.Recorded Acc. Available.